When only a crack shot will do…. 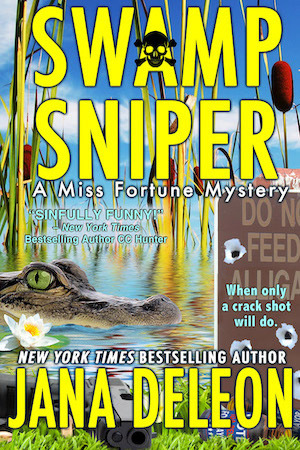 In the two weeks CIA assassin Fortune Redding has been hiding in Sinful, Louisiana, she’s been harassed, poisoned, and shot at…and that was the easy part. But now, she’s about to face her biggest challenge since setting foot in the tiny bayou town. When mayoral candidate Ted Williams is murdered, everyone is surprised. Ted was a blowhole and a Yankee, but those usually weren’t good reasons to kill someone. When Sinful Ladies Society leader Ida Belle becomes the lead suspect in the crime, Fortune knows she’s got to solve a murder and save one of the only friends she’s ever had. But as the investigation begins, more and more secrets surface, and Fortune realizes that sometimes nothing is as it seems.